The 2015 Viper 640 North American Championship set a lot of firsts. With 53 boats, it was the largest Viper regatta in Class history and the largest North American Championship. And, it was also one of the windiest and one of the coldest. Larchmont Yacht Club in Larchmont, NY, with its fleet of 19 Viper 640s, hosted the Class’s 2015 North American Championship. Sailed from Thursday, October 15 through Sunday, October 18, an even dozen races were completed off Larchmont Harbor. Competitors were treated to four days of competitive and challenging races in shifty northwest breezes that gusted to 20 knots frequently, with each day slightly colder than the day before. After starting the week in shorts and short sleeves, racers ended up in full fleece layers and winter hats. In the end, it was Brad Boston (Sarnia, ON), sailing with longtime friend Curtis Florence and championship Viper crew Luke Lawrence, who will now put his name on the Championship trophy for the fifth time. Boston won four races, with another pair of seconds for 45 points after 12 races. That put him 13 points ahead of Australian David Chapman. Chapman, sailing with Jack Jennings and Brendan Larrabee from the U.S., turned in an extremely consistent performance with four seconds and 11 of 12 places in the top ten, winning the final day to jump from fourth to second overall. Given that there were 53 boats in the regatta, and that 25 boats had at least one top-10 finish, Chapman’s consistency was admirable. In third place, with 64 points, winning one race and getting two seconds, was the host club’s Cardwell Potts sailing with his wife Jennifer, Ted Ferrarone, and Kendra Emhiser. Potts’ boat also received the Corinthian Trophy as the top-performing amateur team. In fourth place and receiving the Governor’s Trophy (best performance by a skipper over 55 years old) was Dave Nickerson (Noank, CT), 85 points, with Scott Leming and Tim Desmond as crew. Larchmont YC put on an exceptional regatta. Operating out of the club’s Victorian clubhouse overlooking Long Island Sound, the full resources of the club were made available to the sailors; those coming from Australia, the UK, Canada, and all corners of the U.S. quickly found that being ashore at LYC was as much fun as sailing the breezes in the high teens with relatively flat water. With uncharacteristically shifty northerlies dominating the regatta, the sailing was challenging and often presented opportunities to “get back into the race” by catching a shift. Boat speeds were often above six knots upwind, and downwind speeds would often exceed 16 to 17. With the chilly temperatures on the final day (high of 50 degrees…in the sun), competitors welcomed the comfort food and beer that greeted them every afternoon as they arrived on shore and the three nights’ dinner. Many people were involved in race management, housing, hospitality, the Club’s Marine Facilities department and Catering staff, and logistical aspects of the regatta, at the awards ceremony Viper Class Administrator Buttons Padin thanked Event Chair Peter Beardsley for his extraordinary efforts in amassing a 50+ boat Championship fleet. Working tirelessly, Beardsley created the choreography and chemistry that got virtually all local Viper owners to sail as he matched out-of-towners looking for boats with prospective charterers and filling last minute crew needs. Sailing in a major regatta while also organizing it is a Herculean task, yet Beardsley finished a very respectful 15th and garnered the gratitude of all. 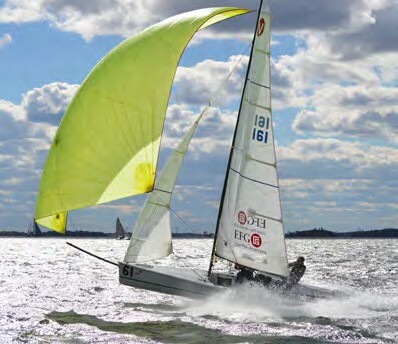 With the Championship in the books, the Viper Class is looking ahead to its fall and winter circuit including the Mid Atlantic Championship in Hampton, VA (November 7-8), the 2015 Bermuda International Race Week (November 19-21), and the Turkey Day Regatta at California’s Alamitos Bay Yacht Club (November 21-22), plus the 3-part Sarasota (FL) Viper Series spanning weekends in December, January, and February. The Viper 640 North American Championship is a qualifier for the EFG Viper Pan-American Championship. Also helping make this regatta a success are PwC, Bell’s Beer, Flintlock Construction, Gubinelli Wines, Rondar Raceboats, Doyle Sailmakers, Gulf Performance Sailing, North Sails, UK Sailmakers, Sail22, APS, Landfall Navigation, and JCD Custom Race Parts. Complete results are posted at yachtscoring.com.